Heterochromia is a condition in which the iris is multicolored. Here, Melly poses to show off her perfect peepers! While she was in for a surgery recheck, our team took the opportunity to snuggle with our beloved little lady. It’s a bird, it’s a plane, it’s Super Fred! 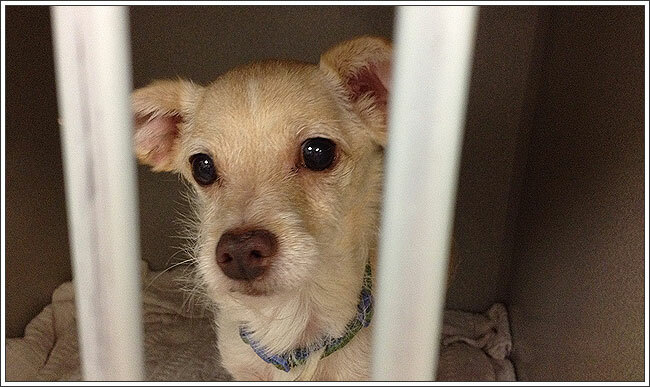 Fred is a fantastic little dog who came in on emergency at ACCESS – San Fernando Valley after he was attacked by a coyote. 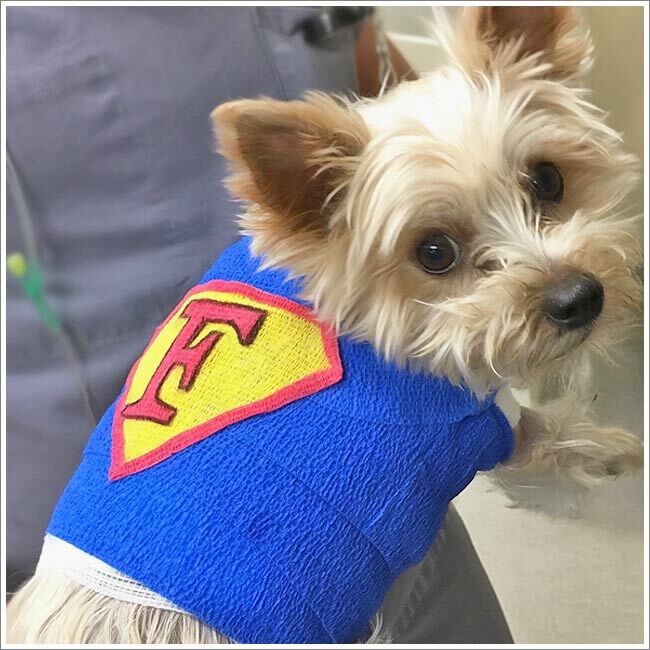 Fortunately he made an incredible recovery from some very serious injuries, making it clear that he certainly is Super Fred, as per his nifty new bandages! When veterinarian, Dr. Hinz, the Medical Director of the Westside Pet Clinic lost her service dog ‘Lucy’ at the beginning of September, they went all out with their efforts to find her, most notably making it on the news and having celebrities helping them with their search. The good news is that on the last day of September, she was found. 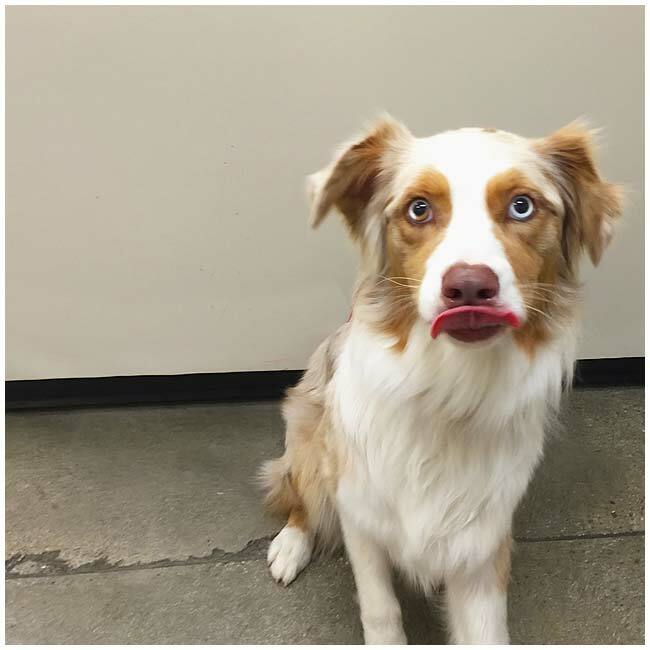 Being a little worse for wear and in need of a check-up, out of all the places Dr. Hinz could have taken Lucy for an exam, she chose ACCESS Specialty Animal Hospital – Los Angeles. 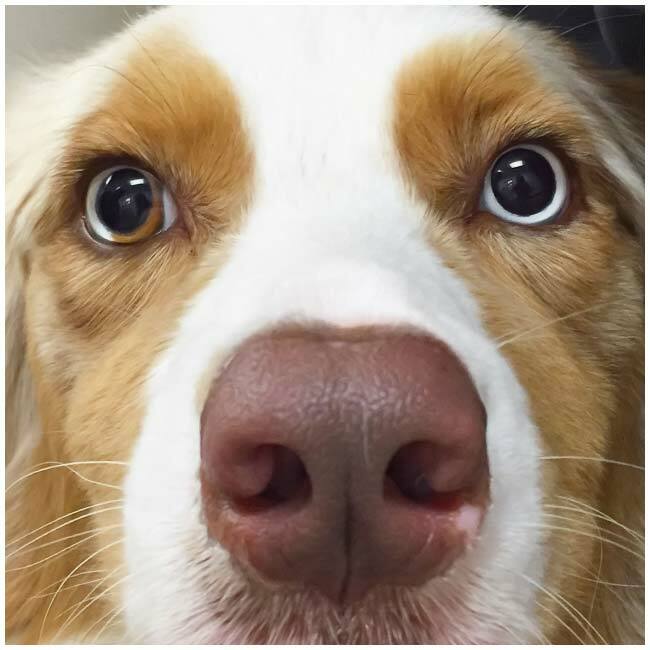 We are extremely proud that the Medical Director for another practice trusted our doctors and staff with her beloved dog, and would like to share the full story with you below. “If she makes it two years, I’ll throw her a party!” said Dr. Jana Norris. 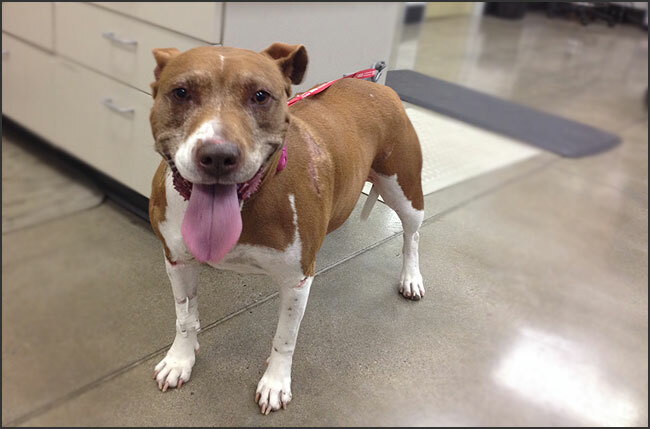 Two years ago, Dr. Norris, the head board-certified surgeon at ACCESS, San Fernando Valley, performed a triple ventral slot procedure on Sarah, a procedure which would prevent this adult dog from becoming fully paralyzed. During the procedure, Dr. Norris found that she also had a thyroid anaplastic acinar carcinoma, an aggressive form of cancer. This was tough news for the then ten-year-old dog and her family, but her owners were determined. They faced each challenge head on, not willing to give up on their furry family member. Sarah was able to be treated for her cancer by the Veterinary Cancer Group, and was eventually pushed through to remission by the wonderful specialists there. Then, in August of 2015, we threw a party for Sarah the dog. Sarah’s battle and recovery are truly amazing and it’s a case like this that reminds each of us why we are here and keep us grateful for the advances in veterinary medicine that make it possible for us to treat beloved animals. “Her prognosis with aggressive high grade and high stage cancer was poor all along, so it is amazing that she made it to two years post-op. That is a very good response to therapy and survival time after this diagnosis.” says Dr. Jana Norris. We were happy to see Sarah back at our hospital, but this time, in our conference room! 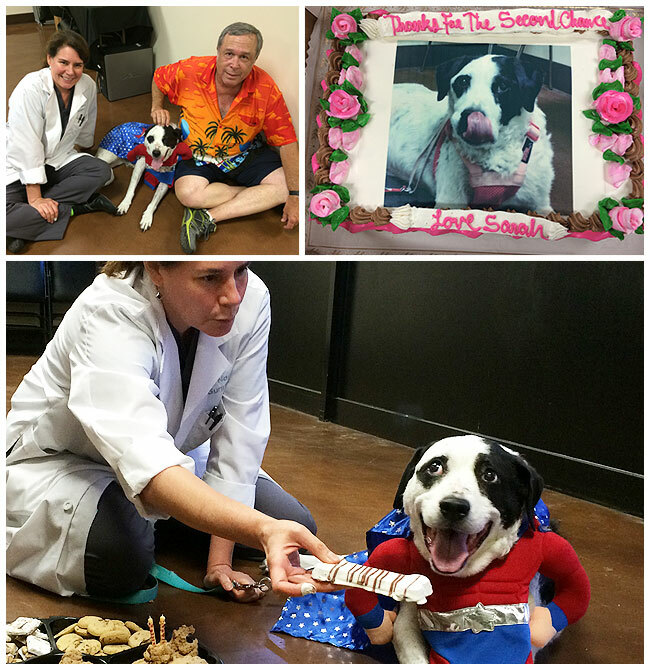 Dr. Norris provided a super-dog costume for super Sarah, who dined on gourmet dog treats; while the humans snacked on pizza. Sarah and her family brought a beautiful cake for the staff, and we all spent time talking about Sarah’s initial visit, her diagnosis, subsequent surgeries, and treatments. We celebrate our patients each and every day, but it was nice to set aside special time for Sarah and her family. Looking at Abigail today, you would never know that she was a victim of heinous animal abuse. This nine-year-old Staffordshire terrier currently resides in Southern California with her loving and dedicated family. However, life was not this easy for her a few years ago. At about one year old, Abigail was found near a vacant house in Lancaster, CA by a neighbor when she was running in circles, on fire. The neighbor quickly put clothing and water on the pup to douse the flames, but it was apparent that severe damage had already been done. Despite the pain, this sweet, battered dog was still trying to wag her tail and even licked her rescuers. Luckily enough, the folks at Karma Rescue sprang into action, ensuring that Abigail would have the funds and medical attention she needed to survive and recover. Her rescuers took her to a local veterinarian, who then referred them to ACCESS Specialty Animal Hospital, Los Angeles a few hours after she had been soaked in accelerant and purposely lit on fire. Abigail would receive advanced medical care from several board-certified veterinary specialists as well as human burn specialists from UCLA. Over fifty percent of her small body was covered in severe burns and her initial treatment included plenty of fluids and pain medication. Her injuries were so bad that she was put into a medically induced coma for the first few days to relieve her pain. Abigail was able to leave the hospital with her new parents and go right into her forever home thanks to the hard work done by Karma Rescue; and has been living the sweet life for the past few years, sunbathing with her family and eating to her hearts content—two of her favorite hobbies! Unfortunately, the damage done to her body still affects her today. Since Abigail’s injury, her skin is much thinner and more delicate than it would have been had she not been burned. Her mom puts veterinarian recommended sunscreen every day, but Abby’s skin has still succumb to sun damage. We want Abigail’s story to show prospective pet owners that there is life after rescue, and that many rescued dogs can live a full, happy life when given a chance; and for anyone who suspects animal abuse to report it immediately. Your information could save the life of a voiceless creature. Please report any suspected animal abuse to your local taskforce. Rex, the dog with nine lives. 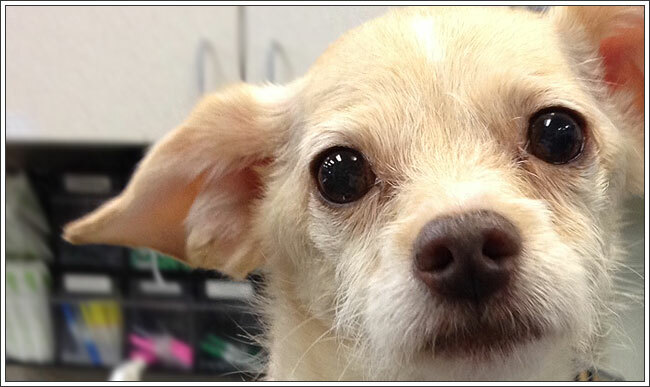 In November 2014, Rex, a nine year old Chihuahua mix, was rushed by his family into the Los Angeles ACCESS Specialty Animal Hospital after collapsing at home. “Triage to the front, STAT!” rang out over the intercom as his lifeless body was brought up to our front desk. Veterinary technicians and assistants promptly dashed to the lobby to get the little guy back to the emergency room, as our triage team prepped the area so that the doctor, Dr. Nicole Skilling, was able to immediately begin chest compressions. Dr. Skilling and her team were able to revive Rex, though suction was needed to clear the airway and due to low oxygen levels, he was intubated, which means his breathing could be done for him. Now safely on oxygen, Rex was given cardiac medication to help stabilize him. Things started to look better for the pup but when he went into cardiac arrest for the second time Dr. Skilling and her team leapt to his side once again to begin chest compressions. They were able to revive and stabilize Rex, keeping him comfortable until he was able to see our specialists the following day for further work up. The following morning, Rex was transferred to the care of Dr. Tina Son, one of our board-certified Critical Care specialists, who kept Rex intubated on full oxygen support and medications. Board-certified veterinary cardiologist, Dr. Steven Cole then saw Rex to check his heart. Eventually he was weaned out of the oxygen unit and allowed to eat on his own, with as much vigor as his “big heart” could muster! Although Rex’s prognosis remained guarded and his care critical, his owners remained hopeful that their boy would make it. Slowly and almost as if by will, Rex began to recover. He was able to be extubated, which means the breathing tube was removed from his trachea, and Rex was doing well in his oxygen unit. He was sitting up, and even able to drink water on his own! 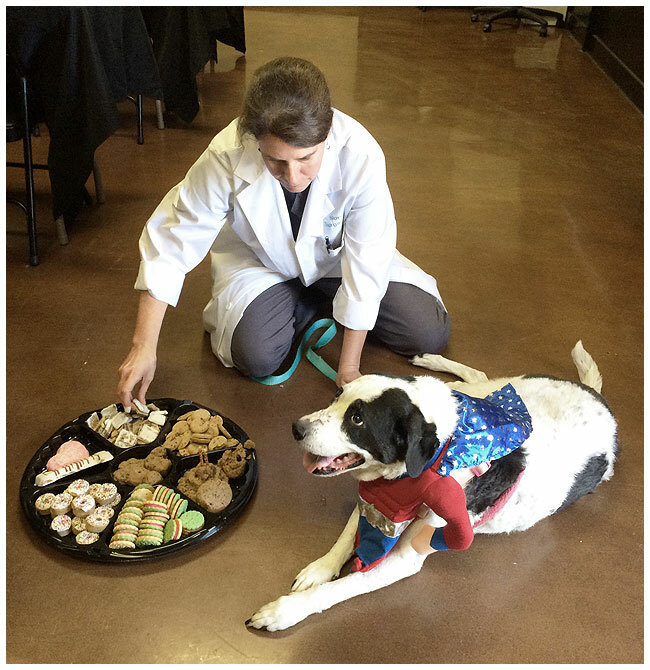 Despite Rex’s exuberance, his owners and doctors insisted on taking things slowly. Eventually he was weaned out of the oxygen unit and allowed to eat on his own, with as much vigor as his “big heart” could muster! Miraculously, Rex was discharged just three days after entering the emergency room dead on arrival; with what some may have thought was little chance of survival. No one was happier to have Rex reunited with his family more than our wonderful team of doctors and support staff….except maybe Rex and his parents. Although Rex’s story is inspiring and resulted in a happy ending, it is important to remember that not all pets are this fortunate. That’s why it is important for pet owners to plan for emergencies. Simply knowing where the nearest 24-hour veterinary emergency hospital is can mean all the difference; because every second counts. We wish Rex and his family all the best and look forward to following his recovery progress. 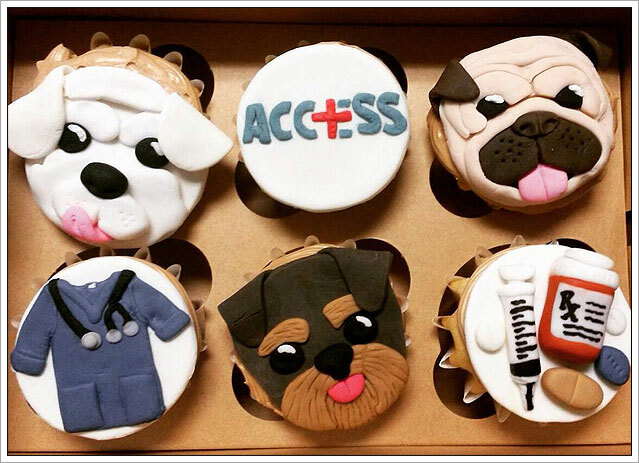 Check out the cupcakes one of our talented clients made for Dr. Arndt, one of our cardiologists. We are so happy to have helped this family. 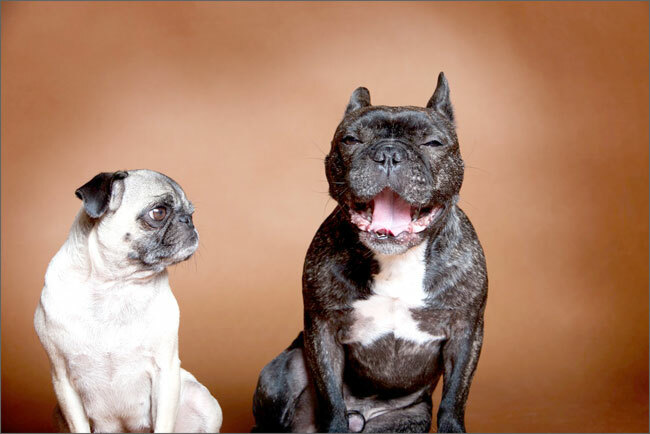 This is Peanut the pug, who was a recent patient and her ‘BFF’ Napoleon the French bulldog. We think they are both adorable.